Fort Mac: A year-long project about Fort McMurray Alta., which has come to be the emblem of Canada's energy sector – and all the issues that surround it. Sometimes it is easy to tell if it's been a successful rescue – the cut and the bruised are talking the whole time they're being loaded into an ambulance. Other times, the silent victims never regain consciousness, maybe never make it alive to the nearest hospital. Nick Mysko learns of their fate the next day. Too often it's another life lost to an unforgiving patch of pavement, the most notorious stretch of roadway in all of Alberta: Highway 63. A year-long project about Fort McMurray Alta., which has come to be the emblem of Canada's energy sector – and all the issues that surround it. For 443 kilometres, this north-south thoroughfare to Fort McMurray and beyond goes by many names – Suicide 63, Highway of Death, Hell's Highway. That's often because people speed or try to pass when it's too dangerous. The end results are left for Mr. Mysko and his three co-workers who operate Highway 63 Rescue. Their job is to be first-responders to accidents on 63. They're funded by a provincial grant and expected to be on call 24/7. The statistics show why: From 2008 to 2012, there were 2,457 accidents along the entire route. From 2002 to 2010, 66 people were killed. The highway's reputation is so bad that some peewee hockey teams in the province refuse to play away games in Fort McMurray. Parents don't want to send their kids up 63. "It can be a boring drive with nothing much to see," Mr. Mysko says of the highway's ability to lull people into a false feeling of control. "You get a call [from the dispatcher], you go in expecting anything." The heightened attention on this highway stems from its role. It's not just essential for transporting goods to the oil sands; it has become the main connection to the rest of civilization for Fort McMurray's burgeoning residential population of 73,000. Passing lanes periodically pop up along the drive down the highway, but it's common for impatient drivers to pass the car in front of them by darting into oncoming traffic sometimes before cresting over blind hills or turning blind corners. From 2008 to 2012, 130 collisions were head-on. 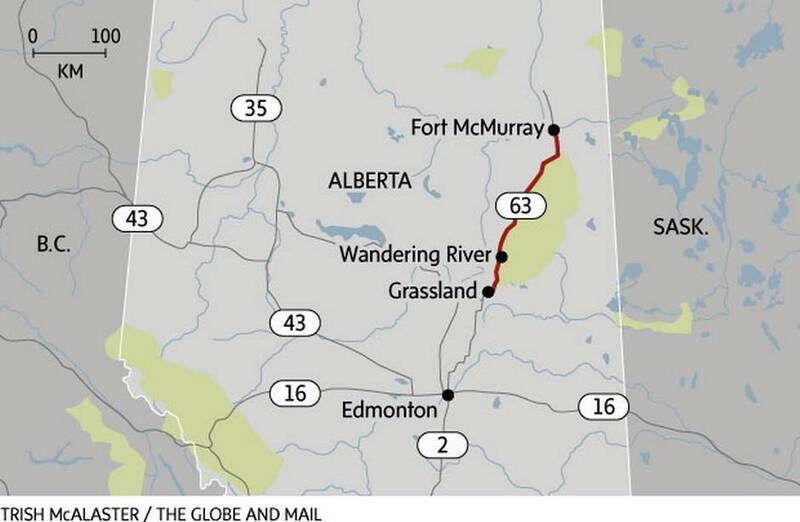 While some sections of 63 had been expanded to four lanes, the 2012 collision prompted a commitment from the province to twinning the highway from Grassland, in the south, up to Fort McMurray by 2016. It will cost $1.2-billion and is close to being completed. "There's a sense that Fort McMurray contributes very, very strongly to Alberta's economy and wasn't receiving an equivalent return," says Transportation Minister Brian Mason. But those who take the highway to work and back say this expensive solution to the problem is no solution at all. The problem isn't just the highway, they say, but the people on it. Countless Canadian highways are populated with their share of dangerous drivers, but here in Northern Alberta, there are a unique set of conditions that have conspired to make recklessness more common. There are wide transport loads that can clog up the road, a lack of turn-offs along the way, and the shift-worker lifestyle. The province says the rate of collisions has been decreasing in recent years, but Mr. Mason is already looking ahead to a new set of issues his government will have to focus on after the highway is twinned. "I don't want to minimize the impact of what we're doing on road safety, but what we are doing may create the potential for other types of bad-driver behaviour," he says. Mr. Mysko can attest to the results. No matter how prepared you are physically and emotionally, he says, "seeing a body in a ditch or seeing a family crying, that's hard to forget." A roadside memorial is seen along highway 63, just north of Fort McMurray. Highway 63 is unlike any other in the province, which is why Alberta's Transportation Ministry cannot say how it compares to others when it comes to collisions. The speed, design and traffic load change abruptly on it when one drives from Edmonton to the Athabasca oil sands. Some twinned stretches of smoothly paved, divided road have limits of 110 km/h, then transition into two undivided lanes with a limit of 100 km/h, before winding down to 70 km/h through the pothole-riddled asphalt in Fort McMurray. The highway is one of the starkest examples of infrastructure development failing to match the speed of population and industry growth. Much of Highway 63 looks like a quaint country road, but it has evolved into the main artery connecting the oil sands to the big cities, and is used to move all manner of things north to the Syncrude and Suncor sites. Drivers who regularly use 63 often have at least one photo on their smartphone of a pre-fabricated bungalow being carted up the road. Others will check one of the many social media accounts devoted to the highway to find out when the super-wide loads are moving through so they can schedule their trips around them. Those loads can be truly beastly: equipment roughly twice the length of an Olympic-sized swimming pool, or so wide it spills over both lanes and onto the shoulders of the highway. Getting stuck behind one for a portion of your journey can turn a four-hour drive into an eight-hour one. After crawling forward for several minutes or even hours, drivers who get the opportunity to pass one of these loads often lay on the gas to make up for lost time. That breeds a misleading sense of invincibility, says Debbie Hammond, the executive director of Coalition for a Safer 63 and feeder roadway 881. The coalition consists of oil companies, local government and a safety authority that has focused on educating drivers as the key to highway safety. "How many times does this driver, this industry worker, get into his vehicle after shift change, drive at least 20, 30 km/h over the speed limit, pass on double solid [lines], pass on hills, pass on corners, and gets home every time?" Ms. Hammond asks. "In his mind, 'This is never going to happen to me.'" Before Highway 63 Rescue was contracted to offer highway assistance, the volunteer fire department in Wandering River was responsible for road rescues in the area. The department had access to an ambulance four days a week, Thursday to Sunday, and it was no coincidence that most of the oil sands work camps' shift changes happened on those days. The Globe and Mail talked to many who have a stake in road rescue – towing companies, safety advocates, first responders – and all cited the shift-worker lifestyle as a major factor in the high rate of collisions on Highway 63. At the camps north of Fort McMurray, the Monday-to-Friday, 9-to-5 work week is replaced with a range of other rotations: 14 days on and seven off, seven on and seven off, six on and one off. Workdays are often 10 or 12 hours long. Most work camps are dry, so the end of a rotation has come to be associated with letting loose. Between 2008 and 2012, 5.6 per cent of drivers in fatal collisions had consumed alcohol, and 28.9 per cent were traveling at an unsafe speed. Ms. Hammond says she's heard about workers who will meet at a gas station after a shift change, fill up their tanks, then set off on Highway 63 as part of a game: First one to Edmonton wins a pot of money. Since the seven-person fatality in 2012, companies have been staggering shift changes to redistribute the traffic flow, but in Ms. Hammond's ideal world, all shift workers would be flown in and out of camp between rotations. "There's a shift change, and a carload of guys are going to go grab a beer and who's the most sober one to drive?" Ms. Hammond says. "I worry about that because it seems to be pervasive. It seems to be an acceptable norm. I don't know how to tackle that." The first rest stop south of Fort McMurray is in Wandering River, a full two hours away. There was one closer, at the halfway point of Mariana Lake, but it closed years ago and drivers who are regularly on the road say that loss has compromised safety. Nelia Esperitu, a petite and chipper Filipino woman who manages the Burger King and adjoining Petro Canada in Wandering River, says drivers stop in for all manner of snacks, but when asked what sells best, she gestures at the plastic dispenser and stack of disposable cups on a counter at one end of the gas station. "The coffee is always selling good because they have to wake up, to stay awake for the drive," she says. The fact that Highway 63 is a long road that cuts through a lot of remote territory isn't just a challenge for drivers trying to stay awake, but also for police trying to crack down on speeding, Mr. Mason says. While enforcement has been significantly beefed up along 63, there are still long sections between where provincial and local police units are stationed. RCMP choppers are occasionally used to bridge these gaps: They observe how long it takes for a vehicle to travel from point A to B, and if it's faster than the speed limit, they radio down for ground patrol to pull over the driver. But that's still not enough. Nathan Bergen, a crane operator who lives in Edmonton and drove much of Highway 63 several times a week, believes the only way to change driver behaviour is to increase RCMP presence around the clock, seven days a week, and to take a cue from British Columbia and adopt harsher penalties: If you are caught at 40 km/h or more over the speed limit, your vehicle is taken away from you on the spot. Mr. Bergen would like to see that happen in Alberta – no more "'we're going to give you a ticket,'" he says. "Stop with this Kumbaya." Highway 63 curves past the Syncrude oil sands site, north of Fort McMurray. "You're doing 100 on here, you might as well be doing 50," says Rod Tubman, pinching some tobacco leaves from a metal tin the size of a hockey puck and placing them into the back corner of his mouth. He no longer feels pressure to keep up with the speed demons on the road around him. Mr. Tubman, who has spent much of his career on Highway 63 moving all manner of goods, grips the knob on his steering wheel to turn left onto the road. On this April day, he's hauling gravel from the pit near House River, about 100 kilometres south of Fort McMurray, to a spot just a few kilometres down the highway where a bridge is being constructed as part of the twinning project. As he slows to turn his 31-year-old dump truck, three vehicles in a row cross over the double solid yellow line into oncoming traffic to pass him. They're impatient. Mr. Tubman's driving instincts are flipped when he drives Highway 63: When he's slowing down to make a turn, he pays more attention to his rearview mirror than to oncoming traffic ahead of him, knowing that many people will try to pass him. He's driven the highway in all conditions. In the winter, he builds ice roads and bridges with a tanker truck. In the summer, he does a lot of hauling with his dump truck. His black Wranglers have been permanently stiffened and discoloured from road dust. Even on this short loop he's driving, he points to multiple markers of past collisions out the window: "See that?" He gestures at the thick tire tracks that show a semi veered off the road and into the ditch. "Look at this," he says, waving a finger in the direction of a 200-foot section of missing guardrail where a truck apparently plowed through. He's personally witnessed vehicles that have made the fatal error of driving on cruise control in the winter – when they hit a patch of ice, they go sailing. Before he went solo, Mr. Tubman used to manage a group of workers at a camp. He'd make them stay overnight after the end of their rotation, knowing well enough from personal experience not to trust them on the road. "I did not want to be responsible for someone leaving my job and not getting home," he says. Capt. Kurt Gudmundson walks into Fire Hall 5, after returning from a call in Fort McMurray. The better calls, the ones they prayed for, would only involve directing traffic until a tow truck arrived. The worse ones required extricating mangled bodies from vehicles. Sometimes there was so much blood they didn't know what body part they were looking at; other times they had to put out fires before they could even think about getting within a few feet of a car to pull out the driver. For a stretch, the break room in the Wandering River Fire Hall was wallpapered with photos from crashes, but eventually they became so numerous and grisly that they were taken down. Before 2012, the first responders on the scene of collisions on the 150-kilometre stretch of Highway 63 – the stretch now handled by the company Highway 63 Rescue – were members of Wandering River's volunteer fire department. They had joined expecting to put out the occasional forest fire or barn blaze. But as oil sands development spurred growth in the area, the job became almost entirely about responding to Highway 63 collisions. By 2011, they were receiving 140 calls a year for road rescue and putting their lives at risk in unexpected ways: Rubberneckers snapping photos on their phones, and impatient drivers trying to blow through the scene, nearly mowed down the volunteers trying to direct traffic at the site of a collision. From a peak of 18 members, volunteers started falling away until they were down to just three in 2010. When a call came in for a road rescue, the department needed at least six people to tend to the scene. In desperation, Ron Jackson, the director of emergency services in Athabasca Region (which includes Wandering River), called a public meeting and asked the 75 residents who attended what it would take them to join the fire department again. Did they want new gear? Compensation? "Basically everyone in that room said, 'We'll join the fire department, that's not the issue, but we're not going out on that highway,'" Mr. Jackson said. Sergeant Julie Murphy is heading southbound on Highway 63, eyeing the vehicles on the other side of the ditch, which are travelling north. From a distance, they may not be able to recognize her black SUV as a police vehicle, but some are reducing their speed as they pass her, like kids running through the hall who slow down in front of the principal's office. She presses the button on her tricked-out dashboard that turns off her radar on a hunch that some of these vehicles are equipped with radar detectors. Policing speed has already become a bigger part of her job in recent years as new portions of the highway have opened, and she believes it will only get worse when the twinning project is complete. One day when construction was still underway on a stretch of the highway north of Fort McMurray near the oil sands, Sgt. Murphy pulled over two drivers who appeared to be racing. The posted limit was 50 kilometres per hour; they were clocked at 190. On a spring enforcement blitz, the force gave out 12,000 tickets to drivers on Highway 63 on the 288-kilometre stretch between Wood Buffalo and Boyle, most of them for speeding. While the sharp drop in the price of oil has challenged the stereotype of the oil-sands worker making more money than he knows what to do with, tickets often don't seem to be much of a deterrent to speeding. An occasional sight along Highway 63, especially in the winter, are abandoned cars in the ditch. After a collision, a temporary worker who might not have insurance for his car will just leave it behind instead of shelling out his own money to get it hauled a long distance by a towing company. Sgt. Murphy once pulled over a car that was heading north to a work camp. "Why are you speeding going to camp?" she asked the two men in the vehicle. "The Roughriders [football] game is starting," they explained.